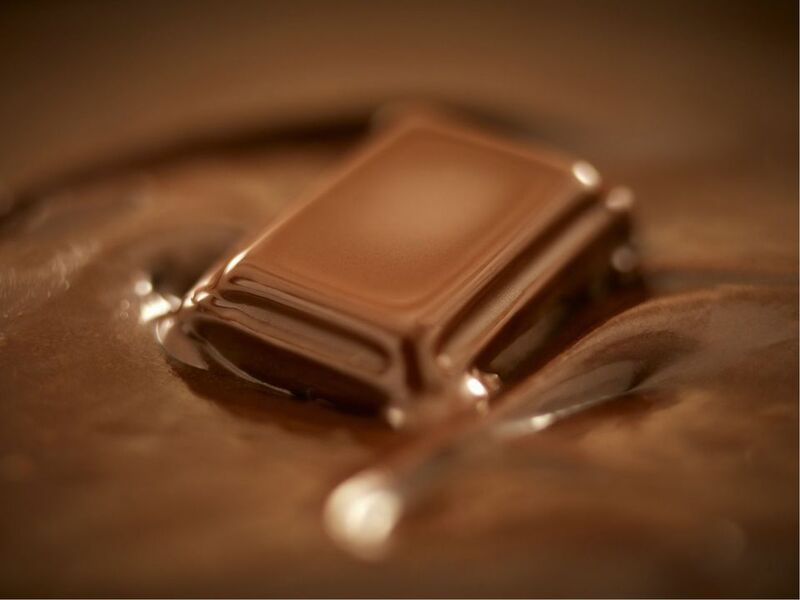 When chocolate melts, it is ideally a beautifully smooth, shiny, satiny mixture. However, there are a number of things that can turn your melted chocolate into a clumpy mess. If chocolate comes into contact with even a small amount of water, it will “seize,” turning into a grainy, clumpy mess in the bowl. Similarly, if chocolate is overheated, it will become quite thick and lumpy. Chocolate is a mixture of fat (from cocoa butter) and dry particles (cocoa and sugar). When chocolate is melted, these ingredients break up evenly, creating a smooth consistency. However, when the melted chocolate comes into contact with water—even the smallest amount—the dry particles become moist and begin to stick together, quickly forming a gritty, rough mass of chocolate. This occurs because when the water joins with the sugar in the chocolate, a syrup is formed, which attracts the cocoa particles and makes for a grainy texture. The most important thing you can do to prevent chocolate from seizing is to eliminate any chance of the chocolate coming into contact with water. Always make sure the bowls and utensils you are using are perfectly dry and avoid using wooden spoons or boards, as they might retain moisture and impart this moisture to your chocolate. If you are using a double boiler to melt your chocolate, keep the water hot but not boiling, or turn off the heat before the chocolate is placed on top—boiling water might splash above the rim of the saucepan and cause droplets to fall in the chocolate. In addition, boiling water gives off a great deal of steam, and steam can also cause the chocolate to seize. Also, be sure to wipe the bottom of the bowl the chocolate is melting in to remove water and condensation. Finally, never cover warm chocolate with a lid, as the heat of the chocolate might form condensation on the inside of the bowl, which will cause the chocolate to seize. This may seem counterintuitive, but the way to fix chocolate that has seized is to add more liquid to it. Adding the right amount of water (or other liquid) will dissolve the sugar and cocoa in the clumps and make it a fluid consistency again. Using 1 teaspoon of boiling water at a time, add to the seized chocolate and stir vigorously until the mixture is smooth. This is ideal when you plan on using the chocolate for a drizzle or sauce, but not if you were incorporating it in a baking recipe since the chocolate is now diluted. If you are using the chocolate for baking projects, there is another solution. Stir solid vegetable shortening into the chocolate, using 1 tablespoon for every 6 ounces of chocolate. Stir gently and evenly until the chocolate has loosened and the shortening is incorporated. You can now use this chocolate for brownies, cakes, cookies, or other recipes that call for melted chocolate. Chocolate is very sensitive to high temperatures and different chocolates require different maximum temperatures. Dark chocolate should never be heated above 120 F, while milk and white chocolates should never be heated to above 110 F. It is quite easy to exceed these temperatures if using a double boiler with boiling water, or if microwaving on full power. Overheated chocolate will lose the silky shine of melted chocolate and become thick and muddy. The best way to melt chocolate is in a double boiler, keeping the water hot (but not boiling), and using a chocolate or instant-read thermometer while melting the chocolate. Like seized chocolate, overheated chocolate can be rescued. First, you will want to cool the chocolate, as it is harder to save overheated chocolate that has been at a high temperature for a long time. To cool the chocolate, remove the bowl from the heat source, transfer the chocolate to a dry, cool bowl, and stir in a handful of solid chocolate chunks. Stir constantly and allow the solid chocolate to bring down the temperature of the melted chocolate. If the chocolate remains thick or lumpy, try straining it through a sieve first. If this doesn’t solve the problem, add a spoonful of vegetable oil or melted vegetable shortening and stir thoroughly. You can also try adding some freshly melted chocolate with a few drops of soy lecithin (an emulsifier, available at health food stores), or using a handheld immersion blender to smooth the chocolate. If none of these tricks helps your chocolate, save the chocolate to use in baking recipes.